Charge Shot!!! : At the Mountains of Madness- Part Nine: "The Beautiful Girls"
At the Mountains of Madness- Part Nine: "The Beautiful Girls"
We've compiled an essay about how terrible your chosen profession is. It's called "Nuremberg at Charge Shot!!!" and it follows the jump. 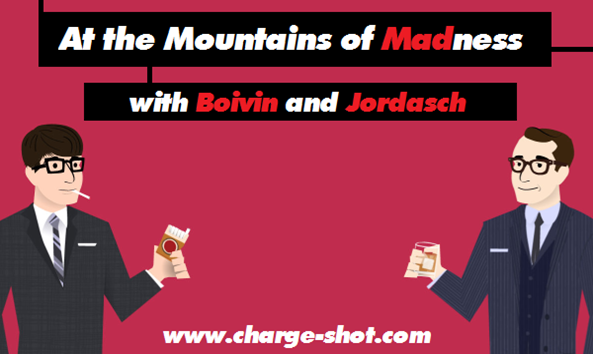 Boivin: We have discussed it here but I would like to officially go on record and agree that the fourth season of Mad Men may be the best since the first. After “The Suitcase” which I’m pretty sure is almost everybody’s favorite episode so far, Weiner and co. are on a roll and barring any major disaster I think they might have the best season of them all when all is said and done. Jordan: I’m glad you’ve come over. The responses to the simple (but hilarious) “Sad Don Draper” meme have pointed out that Mad Men has one of the most fickle audiences of any show on television. But even the NPR-listening, microbrew-swilling, horn-rimmed glasses-wearing snobs that make up Mad Men’s audience seem united in their love of this season. It’s just more of everything we love about Mad Men; it’s funnier, it’s more dramatic. It’s only slightly less inscrutable and deliberate, which did raise a red flag for me initially. But I think it’s clear Weiner’s got a winner. Boivin: I think the show is really mastering the art of balancing shifts in tone. Back in the day, you generally had a solid hour of ennui peppered with the occasional bon mot from Roger or some sort of joke about Paul Kinsey’s beard. Since last season’s Lawnmower Episode, Mad Men’s been showcasing a marked degree of absurdity, and oddly enough it works. Can you even imagine the Ms. Blankenship postmortem shenanigans two or three years ago? Jordan: Absolutely not, and I give the writing staff enormous credit for keeping so many balls up in the air. They’ve also managed the same feat with the cast, maintaining the audience’s interest in the show’s wide variety of interesting characters. I know Andrew complained in the comments last week that we weren’t seeing enough of certain characters Boivin may or may not be illegally attracted to, but a show that keeps the focus on a couple of characters per episode can’t switch between 10 or 12 plotlines in an hour like, say, The Wire. Jordan: I thought I was the only one wondering whether Sally wished she was watching The Man from U.N.C.L.E. again while she was sitting on the couch with Don. I think that’s the most impressive thing about Shipka’s performance. She manages to be utterly sympathetic while also seeming too much her mother’s daughter. I did find myself wishing Bobby was there to complain about how much ice cream he had to eat or something adorable, though. But he just ain’t that interesting. Boivin: I liked how in Faye it’s the first time we’ve really gotten a Draper girl who is part of his life as a whole and not just some tawdry fling. Every other woman he’s carried on with has been some sort of outsider whom he has to keep secret, but Faye is his personal and professional equal, and he really has a connection with her that seems to go beyond the typical “you’re not like Betty” concept. Introducing her to Sally, which was bound to happen runaway or not, was a major step for Don: he’s moving beyond living two lives. Jordan: I like how Don shoving Faye into the room with Sally both indicated that he’s opening up to her and showed that he’s still emotionally retarded. Faye was totally right to be put off by the position Don put her in (not that position! ), but in his own stupid way, Don showed he really likes this one. Cut the guy some slack, too. He just lost Her Majesty. Boivin: The aforementioned lawnmower seemed like the be-all end-all of silly Mad Men antics. Season Four just gave Three a run for its money. The Queen of Perversions’ passing was totally fitting for her character, existing seemingly for nothing more than making old lady jokes, groaning, and keeping Don from ever having an erection ever again. I loved watching the gang fumbling around with her dead body trying to remove her from her desk with some dignity. I loved roshi Cooper-sensei’s on-the-spot obitubary: “She was born in 1898 in a barn, she died on the thirty-second floor of a skyscraper: she was an astronaut.” And Roger’s last glance at the late “hellcat” as she was wheeled out of Sterling Cooper Draper Pryce one last time was telling. There was a lot to be told about Roger and women this week, wouldn’t you say? Jordan: It really is striking how Weiner has managed to turn all of Joan’s strengths into weaknesses this time around. While she seemed in the first season to have Roger and the rest of the boys wrapped around her finger, this time she’s under their thumb. Boivin: I can’t believe Joan and Roger actually got back together, if only briefly. I guess we should have been expecting that but Lord knows the people pulling the strings have led us viewers astray before. But with a rapey husband who is for sure going to Vietnam now and a firm realization that they didn’t get the lives either of them wanted, it seemed like only a matter of time before these two old flames found each other again. 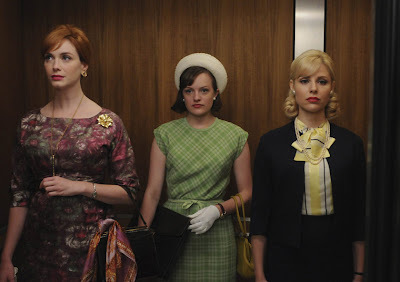 The last shot, with Joan, Peggy, and Faye in the elevator was what the story of these women is all about. Will you be the wife or the career woman without a family of your own? Women like Peggy have this choice to make, and Mad Men’s been confronting it and the other political issues of the day harder than ever. Jordan: All praise to Weiner for eschewing clear opposites in favor of something richer and greyer. Peggy could have become the hippie to Joan’s old-world mom type, but there’s something of the latter in the former. We’ll see if it goes both ways.